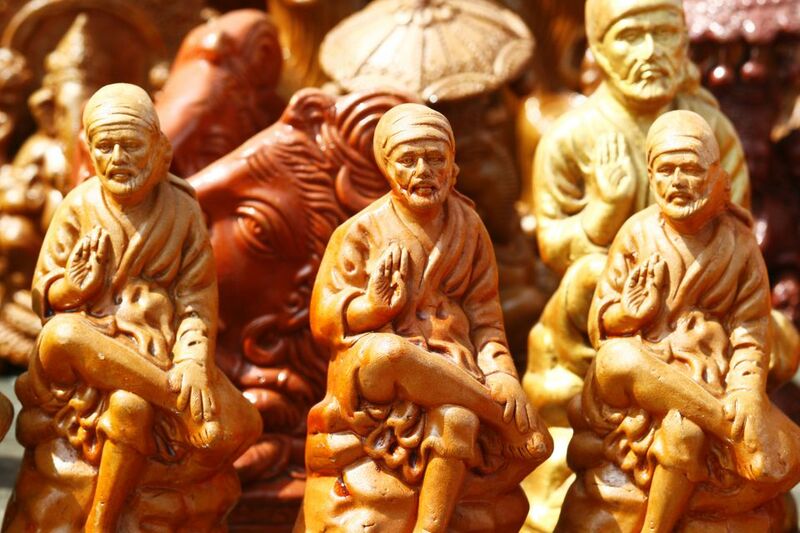 Shirdi is a small town in India that's devoted to the popular saint Sai Baba. He preached tolerance towards all religions and equality of all people. Devotees flock to Shirdi, as an important pilgrimage place. Sai Baba of Shirdi was an Indian guru. His place and date of birth is unknown, although he passed away on October 15, 1918. His body has been entombed at the temple complex in Shirdi. His teachings combined elements of Hinduism and Islam. Many Hindu devotees consider him an incarnation of Lord Krishna, while other devotees consider him to be an incarnation of Lord Dattatreya. Many devotees believe that he was a Satguru, an enlightened Sufi Pir, or a Qutub. Sai Baba's real name is also unknown. His name "Sai" was apparently given to him when he arrived at Shirdi, to attend a wedding. A local temple priest recognized him as a Muslim saint, and greeted him with the words 'Ya Sai! ', meaning 'Welcome Sai!'. The Shirdi Sai Baba movement began in the late 19th century, while he was living in Shirdi. After 1910, his fame began to spread to Mumbai, and then throughout India. Many people visited him because they believed he could perform miracles. Shirdi is located around 300 kilometers from Mumbai, and 122 kilometers from Nashik, in Maharashtra. It's most popularly accessed from Mumbai. By bus, traveling time is seven to eight hours. It's possible to take a daytime or overnight bus. By train, travel time ranges from six to 12 hours. There are two trains, both of which run overnight. Find out more about how to get from Mumbai to Shirdi. If you're coming from somewhere else in India, Shirdi's new airport started functioning on October 1, 2017. Flight 9I-653 departs Mumbai at 3.20 p.m. and arrives in Shirdi at 4.05 p.m. on Mondays, Tuesdays, Thursdays and Saturdays. On the same days, flight 9I-654 departs Shirdi at 4.30 p.m. and arrives in Mumbai at 5.15 p.m. Flight 9I-653 departs Mumbai at 8.30 a.m. and arrives in Shirdi at 9.15 a.m. on Wednesdays, Fridays and Sundays. On the same days, flight 9I-654 departs Shirdi at 9.45 a.m. and arrives in Mumbai at 11.05 a.m. Flight 9I-869 departs Hyderabad at 2.40 p.m. and arrives in Shirdi at 4.25 p.m. every day. Flight 9I-869 departs Shirdi at 4.45 p.m. and arrives in Hyderabad at 6.30 p.m. every day. Ventura Airconnect operates non-scheduled flights to Shirdi from Surat in Gujarat. SpiceJet is expected to begin Delhi-Shirdi flights from October 2018. Other airlines will commence flights at a later date. The other nearest airport is at Aurangabad, around 2 hours away. Alternatively, trains from quite a few cities stop at the railway station in Shirdi. Its name is Sainagar Shirdi (SNSI). Weather-wise, the best time to visit Shirdi is from October to March, when it's cooler and dry. The most popular day to visit is on Thursday. This is his holy day. Many people who want a wish granted visit the temple and fast on nine consecutive Thursdays (referred to as the Sai Vrat Pooja). However, if you do visit on Thursday, be prepared for it to be extremely crowded there. There's a procession of Sai Baba's chariot and slippers at 9.15 p.m.
Other busy times are on weekends, and during the Guru Purnima, Ram Navami, and Dusshera festivals. The temple is kept open overnight during these festivals, and the crowd swells to a suffocating size. If you want to avoid the crowds, apparently Fridays at 12-1 p.m. and 7-8 p.m. are good times to visit. Also, daily from 3.30-4 p.m. The temple complex is made up of a number different areas, with different entry gates depending on whether you want to wander around the temple complex and have darshan (viewing) of the Sai Baba idol from afar, or whether you want entry to the Samadhi Temple (where Sai Baba's body is entombed) and make an offering in front of the idol. You'll be allowed into the Samadhi Temple for the morning aarti at 5.30 a.m. This is followed by the Holy Bath of Sai Baba. Darshan is allowed from 7 a.m., except during aarti time. There's a half hour aarti at noon, another one at sunset (around 6-6.30 p.m.) and a night aarti at 10 p.m. After that, the temple closes. Abhishek puja also takes place in the mornings, and Satyananarayan puja in the mornings and afternoons. Offerings such as flowers, garlands, coconuts, and sweets can be purchased from the shops in and around temple complex. You should bathe before entering the Samadhi Temple, and washing facilities are provided at the temple complex for doing so. The time taken to line up for the Samadhi Temple and have darshan varies. It can be completed in one hour, or can take up to six hours. The average time is 2-3 hours. All the main attractions related to Sai Baba are within walking distance of the temple. If you don't want to wait and are willing to pay a bit extra, it's possible to book both VIP darshan and aarti online. Darshan costs 200 rupees. It's 600 rupees for the morning aarti (Kakada aarti), and 400 rupees for the noon, evening and night aarti. These are the new rates, effective from March 2016. Visit the Shri Sai Baba Sansthan Trust Online Services website to make bookings. Entry is through Gate 1 (VIP gate). You can also get darshan tickets at the VIP gate, except on Thursdays. The temple trust provides a huge range of accommodations for devotees. There's everything from hall and dormitory accommodations, to budget rooms with air-conditioning. Rates cost from 50 rupees to 1,000 rupees a night. The newest accommodations were built in 2008 and are at Dwarawati Bhakti Niwas. The biggest accommodation complex, consisting 542 rooms of various categories, is Bhakta Niwas around 10 minutes walk from the temple complex. Book online at the Shri Sai Baba Sansthan Trust Online Services website. Or, visit the Shri Sai Baba Sansthan Trust Reception Center in Shirdi, opposite the bus stand. Alternatively, it's possible to stay in a hotel. Recommended ones are the Marigold Residency (2,500 rupees upwards), Hotel Sai Jashan (2,000 rupees upwards), Keys Prima Hotel Temple Tree (3,000 rupees upwards), St Laurn Meditation & Spa (3,800 rupees upwards), Shraddha Sarovar Portico (3,000 rupees upwards), Hotel Bhagyalaxmi (2,500 upwards, or 1,600 rupees from 6. a.m. to 6. p.m.), Hotel Saikrupa Shirdi (1,500 rupees upwards), and Hotel Sai Snehal (1,000 rupees upwards). To save money, check out the current special hotel deals on Tripadvisor. If you don't have a place to stay in Shirdi, you can keep your belongings at the Shri Sai Baba Sansthan Trust for a nominal fee. Shirdi is a safe town but it does have its share of touts. They will offer to find you cheap accommodations and take you on temple tours. The catch is that they'll also pressure you to buy from their stores at inflated prices. Be aware of and ignore anyone who approaches you.